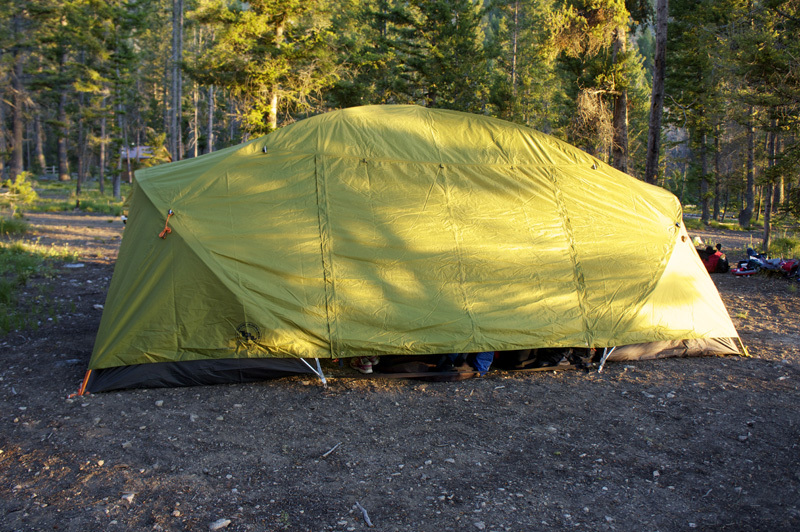 Car camping prioritizes space over weight, so we often reach for the big’ol one-room tent. 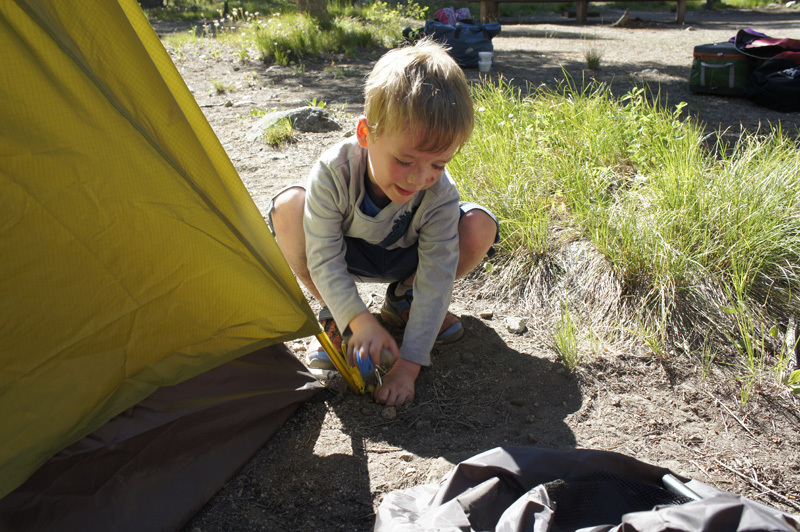 But sometimes, whether camping with friends or kids, we still need a little space of our own. Big Agnes, with its footprint planted firmly in big open spaces, designed the Wyoming Trail 4 (WT 4) Camp with this in mind. The WT4 is best appreciated as two two-person tents connected under one very large vestibule, providing a central community space. Intrigued by its west wing/east wing sleeping quarters, I saddled up with the WT 4 on a boat camping trip to Redfish Lake, Idaho. Unlike the hussle and bussle of the lower campground, we had the upper camp all to ourselves and room to spread its colossal mass. Here’s our experience. Price: Wyoming Trail 4 Camp: $550 (tested). A smaller version, the Wyoming Trail 2 Camp, is available for $400. Important Specs: The WT 4 comes packed folded as a taco with the fly on one side and the tent body on the other. The poles are sandwiched in an attached pole-sleeve sewn to the middle. The 16 stakes and a pole repair patch zip nicely in their own pouch. Two straps completely wrap the tent taco and have generous handles. Buckled closed, the tent carries as a handbag or can be slung over both shoulders like a makeshift pack, freeing your hands to carry a stove, cooler, etc. Men will like this because it simultaneously shows your ingenious ability to pack efficiently and brawny stupidity to carry as much from car to camp as possible in a single trip (its marking our territory). 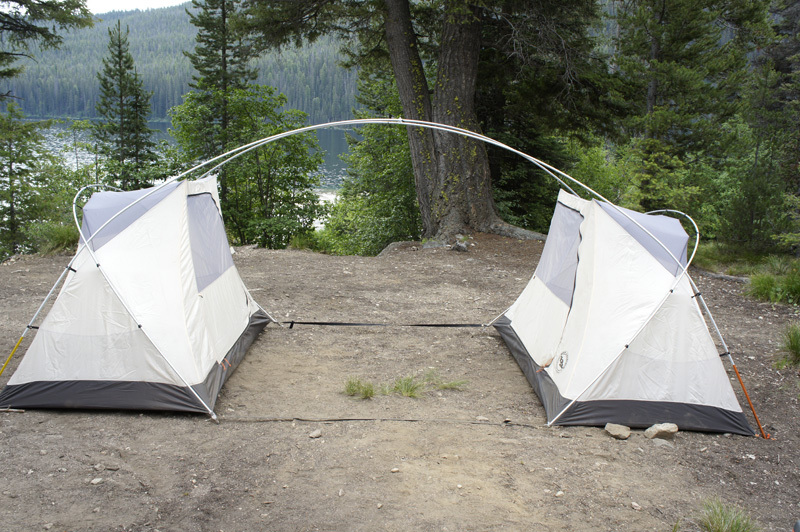 The core of the WT 4 is a pair of two identical two-person tents connected under one vestibule. 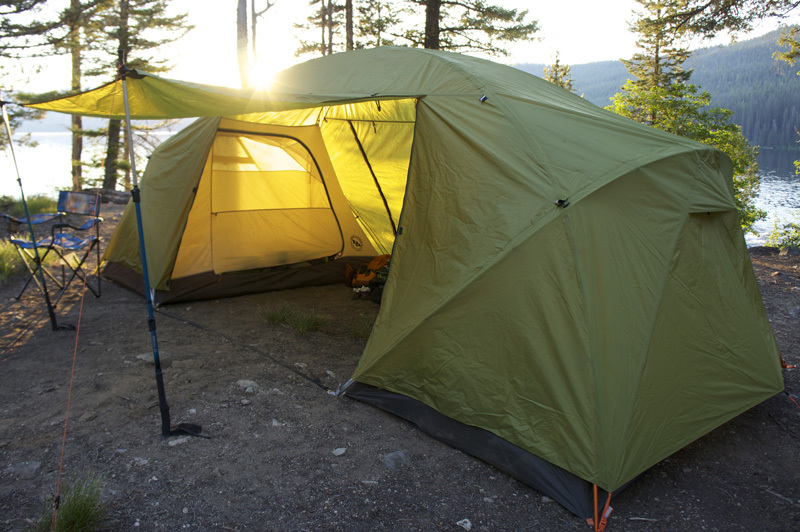 Each tent has a lightweight nylon lower portion with a large mesh upper half providing adequate ventilation. Each tent opens out to the central vestibule via a double-zipper door that peels to the (facing) left side where it can be tacked open. Each tent has two large mesh pockets, one at the head and another at the foot wall, and can hold a large collection of supplies, maps, toys, crayons and coloring books. To pitch the tent, you unroll the two tents over an open space and match the two longer color-coded aluminum poles across the center to their coordinating grommets on the opposite side. The crossing poles are tethered together with a clip at their intersecting peak. 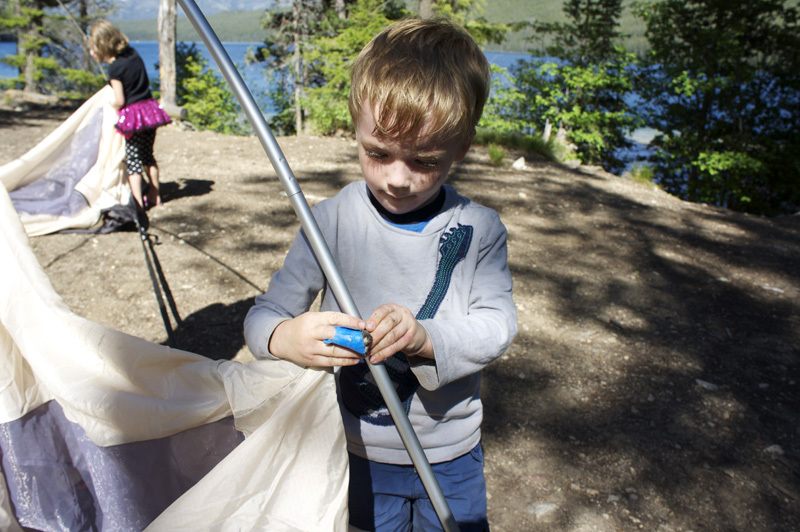 You then attach the tent body to the poles through the plastic clips. The second set of poles arch behind each sleeping quarter and the remaining clips will bow the sleeping quarters out laterally. The large fly battens tight to the tent with color-coordinated plastic side-release buckles. The fly has two large bay doors that close shut with two parallel vertical zippers. One or both doors can roll up or pitch out to provide a shaded breezeway. We opted to keep one door shut and pitch the other out over trekking poles (not provided). Because of its high profile, Big Agnes recommends you stake out all the points and guylines, less you risk a giant green kite tumbling through the campground. It takes about 10 minutes to pitch the tent. The clips and color-coordinating design make this a family-friendly operation. Awesome! Big Agnes should have named this tent the Garage-majal. The WT 4 vestibule is just shy of 50 square feet, which is enough to park your Fiat inside. It was enough space to swallow a fully inflated pack-raft, four duffle bags, and still have room for two adults to kick back in folding chairs. Pitch both doors out and you get an additional 68 square feet of shade. Distance can make the heart grow fonder. The separate sleeping quarters allow parents to unwind a little bit or give you and your friends some space. Take note — the upper half of the door is mesh so you don’t have complete privacy. The taco-style bag keeps the tent organized and easy to carry. It also packs up very well. You simply stuff the tent on the tent side and the fly on the fly side, zip the pegs, stuff the poles, buckle, and carry. Flaw: The average two-person sleeping quarters are dwarfed by its supernova volume. Big Agnes could have probably eaten into the vestibule real estate some to give us a little more workable sleeping space. The two mesh storage sleeves (two in each sleeping quarter) are huge, but I would have liked to see more storage options in this basecamp tent. My expectations could have been spoiled by the superior gear bins Big Agnes gives us in its Scout series. A gear loft is an aftermarket purchase. The two wings are tethered together at the floor of the vestibule by a front and back black strap whose low profile skates below both entryways, which I flagged as a trip hazard. In fact, while getting a picture of this, my boy clipped a wing on a flyby. You can eliminate this by 1) keeping one door shut, and 2) straddling the tent over a bit of a hump so the strap is stretched snug over the ground. Boring But Important: Double-wall construction. Tent body is a lightweight nylon lower half sewn to a poly mesh top. Fly and floor are a rip-stop silnylon with 1500mm waterproof polyurethane coating. Solvent-free polyurethane taped seams. Reflective guyline and webbing at tent corners and anchor points. Vestibule has walk through doors that can roll up or pitch out as an awning. Comes with 16 aluminum stakes and four collapsible aluminum poles, color-coded for easy setup. Plastic clips attach tent body to frame. Double rainbow zippers close the sleeping quarters. First Impressions: The double-room capacity of the WT 4 immediately catches your attention and runs your imagination. I visualized a night sipping wine with my wife, reading by lantern light under its yawning veranda followed by sleeping peacefully without a child’s size 7 foot to the neck. A man can dream…I had my wine but still woke up with a kid’s foot to the face. The tent is a behemoth that requires nearly an 85-square-foot swath of land to pitch it over, perhaps challenging even some drive-up campgrounds. And the two living quarters seem compromised by the massive central space. But if you bring a lot of family gear, the results are quite nice. The spacious garage can stow bikes, chairs, boats, and other expensive toys out of sight while away for the day and provide an architectural amenity to your campground when creatively pitched. Even by Big Agnes standards, the $550 WT 4 is expensive. Being nearly two tents, I wondered what it might take to cut the cord, provide an additional single tent vestibule for each tent, and along with it, the flexibility to bring half of the WT 4 on longer trips deeper into the woods.